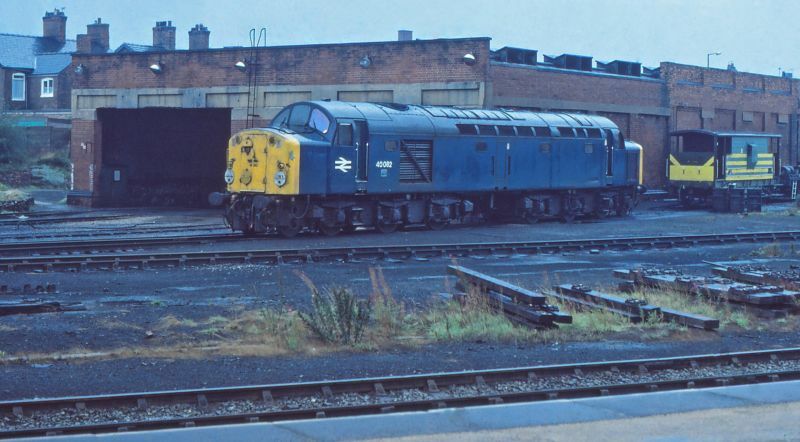 Martyn Hilbert's Railway Photography - Last additions - Class 40, 40082 at Northwich Depot. Class 40, 40082 at Northwich Depot. On a damp 9th September 1984, 40082 was stabled outside Northwich Depot between duties. The loco was new from Vulcan Foundry at Newton-Le-Willows in June 1960 as D282. Its first allocation was at York (50A). It spent 13 years as an Eastern Region machine before being transferred to the London Midland Region in 1973. 40082 was withdrawn from service due to power unit damage in November 1984 and was scrapped at Crewe Works in January 1986.